Cool Down IKN Pendulum Cooler® and KIDS® are designed to reach low clinker outlet temperatures at high recuperation rates. 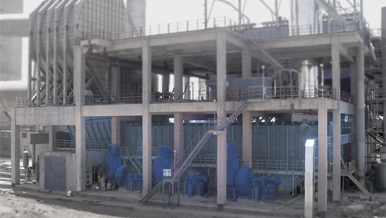 More than 35 years of building clinker coolers and over 600 installations worldwide prove that the IKN cooler is at the forefront of technology. Following the stationary inlet (KIDS®), the cooler is divided into separately aerated compartments. Precise design and manufacture of cooler components remove the need for complex single air ducts. Optimised formation, aeration and transport of the clinker bed allow IKN coolers to operate at higher loads per m² of cooler surface. Cold clinker discharge temperatures are maintained with the lowest air loading per kg of clinker. Excellent clinker distribution resulting in uniform, efficient cooling of the clinker across the full width of the cooler. Low construction height and compact design. Robust, low-wear and easy to maintain design leading to outstanding availability. Modular design allows pre-assembly and reduces on-site assembly time. Lowest electrical power consumption in the industry. IKN also offers specialised Pendulum Cooler® services. Details can be found under Services.